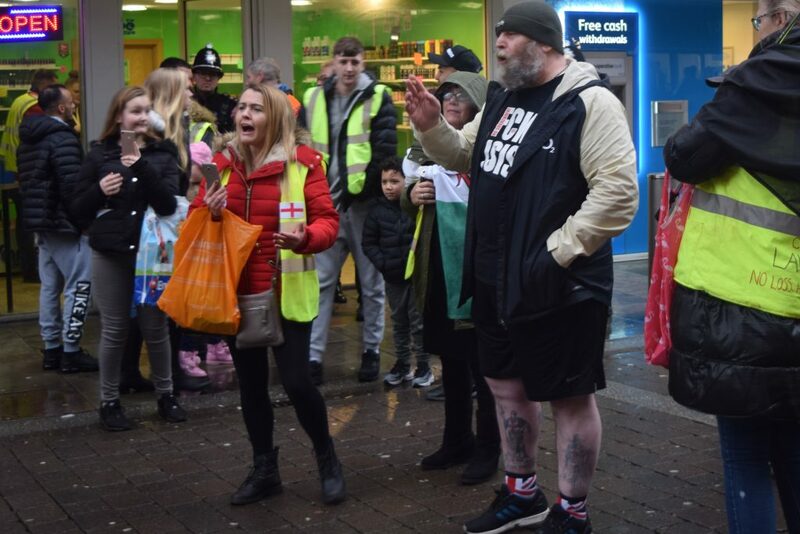 Anti racist campaigners gathered in Newport on 19th January, to let racist trouble maker James Goddard know he was not welcome in Wales. Posts appeared on social media on Friday night indicating that Goddard would be heading to Newport under the guise of the ‘Yellow Vest Movement’. He is currently on bail and banned from protesting in London. With only a few hours notice word spread amongst activists, ensuring that on the day anti-racists outnumbers racists at least two to one. 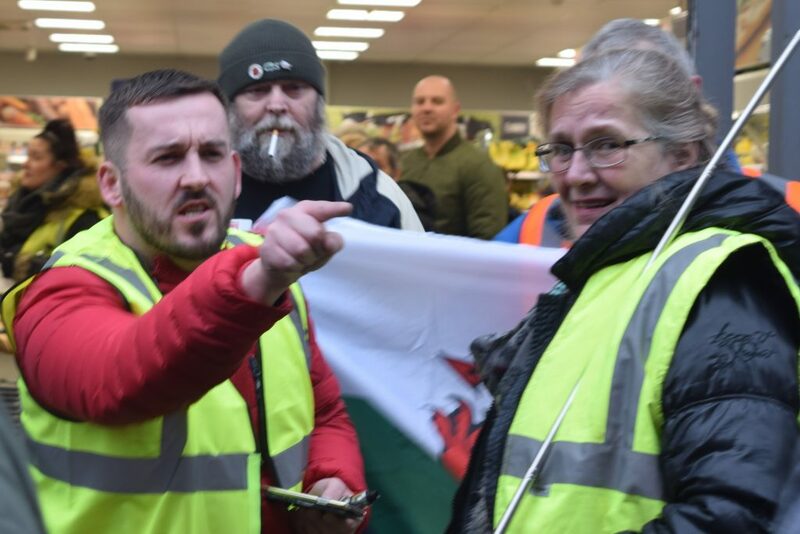 It was unclear what the Yellow Vest protest was about, initial posts had suggested it was a pro-Brexit gathering but within minutes of getting off the train Goddard was telling all that would listen to him that he hoped all Muslims would burn in hell. Goddard made headline news recently when arrested in Parliament Square for harassing Tory MP Anna Soubry and journalist Owen Jones. He has taken a leaf out of the book of Stephen Yaxley Lennon (AKA Tommy Robinson) in that he has given up work and set up on line funding accounts for people to donate to him so he can travel the country stirring up hate. Goddard, and many others, has jumped on the band wagon of the French Yellow Vest Movement which has been protesting against the French Government. Far right activists have donned high visibility jackets on a number occasions to hold protests, with trouble often resulting. 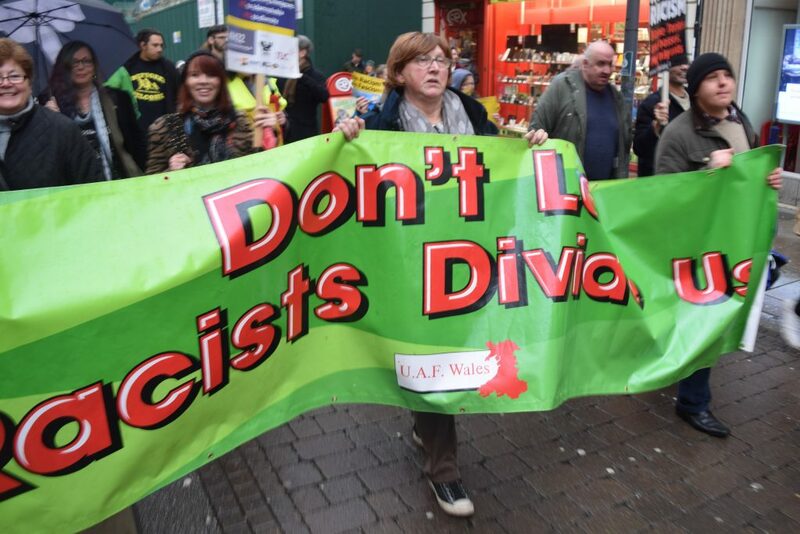 They have attacked an RMT picket line in Manchester, and clashed with the police in London and Leeds. The irony of far right euro sceptics adopting the symbol of predominantly left wing European activists appears lost on them. This is the second time they have met in Newport this year and on both occasions they have been outnumbers by ant-racist protestors. On 19th January around a dozen of them travelled to Newport. As far as we can tell none of them were actually from Newport and most of them were not welsh. One dapper individual was sporting union jack socks and a ‘F**K ISIS’ T-shirt. They walked around waving union jack flags, promoting islamaphobic and anti-migrant hatred and arguing with counter protestors. What their aim had been was unclear, but they left shortly after arriving having achieved nothing other than shouting abuse at local people. They then caught the train to Cardiff where they filmed themselves handing out cigarettes to the homeless, hanging about outside pubs and wandering trying to find the Welsh Assembly building. “There is a danger that by protesting against them they gain more publicity, and there is no doubt this is all about feeding the ego of a handful of individuals. But the far greater risk is to allow them to think they can come into our diverse communities and spread their division and hatred unchallenged”. 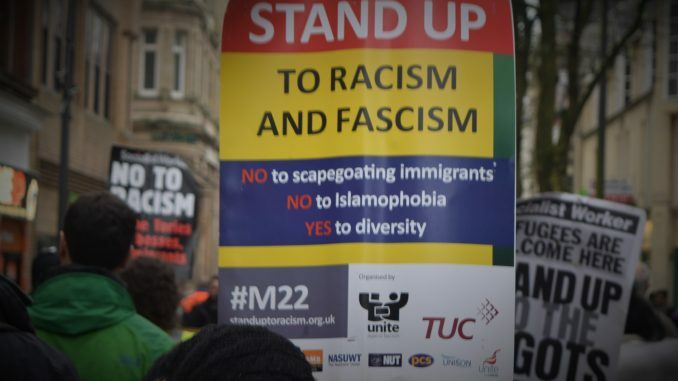 “The one positive from all of this is that it has reinvigorated anti-racist organising in Newport, with meetings organised and networks being set up to ensure we can respond to this sort of event quickly. No doubt it will also boost attendance at the UN Anti Racist march and rally in Cardiff on 16th March”.